and/or Best Exhibit in the Show at RHS Botanical Art Shows. one "Best Painting in Show". have their botanical artwork included in major/notable collections. 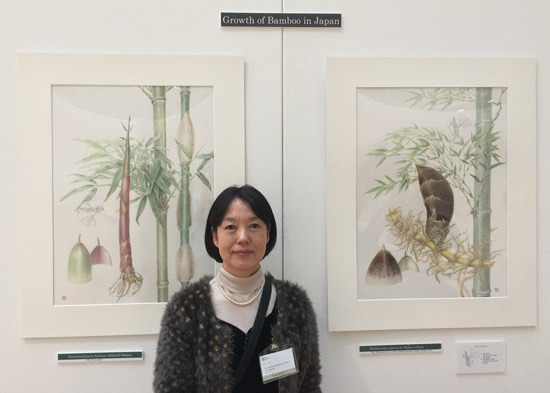 Banner Image: Kumiko Takano's exhibit of Climbing Plants at the RHS Botanical Art Show in February 2015 - which won "Best Exhibit"
In the History section you can read about Famous Asian Botanical Artists (600-1900). At present, it includes artists from China, India and Japan. - taught most of the contemporary botanical illustrators in China. He has also exhibited widely including at the Hunt and the Missouri Botanical Gardens. He is retired from a senior position at the Botanical Institute in Beijing. - b. 1939 Kunming, China, 1939. Between 1958-1997, he worked as a senior engineer of Kunming Botanical Research Institute of the Chinese Academy of Sciences and as Illustrator, Kunming Institute of Botany, Chinese Academy of Sciences, Kunming, 1958–1997. He is a former Chairman of the Botanical Scientific Illustration Society of China. He created more than 2,000 illustrations and has been published in over 50 scientific publications - including 'Flora of China'. He has been selected for numerous national exhibitions in China, the United States, Canada and Australia. Exhibited at the 15th International at the Hunt. ​- b. 1958. Graduated from Rajasthan School of Arts, Jaipur in 1981. His botanical artwork featured in a solo exhibition, Enduring Perfection: Paintings by Damodar Lal Gurjar, at the Hunt Institute for Botanical Documentation in 2001. He has work included in A Passion for Plants: Contemporary Botanical Masterworks. ​- b. 1974. Botanical Illustrator who was born, lives and works in Kalimpong, Darjeeling, West Bengal. She has a Diploma in Botanical Illustration from Kew and Master’s Degree in Natural History Illustration and Ecological Studies from the Royal College of Art, London. Winner of the Royal Horticultural Society's Gold Medal (1999) and 18th world Orchid Conference Gold Medal (2005) for her paintings of India's wild orchids. She has produced illustrations for numerous botanists. In 2008, she was invited by the British Museum, London to exhibit her paintings at the Museum. Engaged in building the Himalayan Institute of Natural History Art. 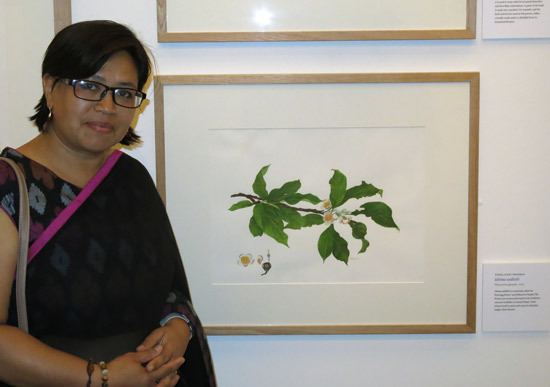 Indian Botanists Article: Botanical Illustration, painting plant species the scientific way- a dialogue with Hemlata Pradhan. This illustrated catalogue was published in connection with exhibitions of artwork of Indian trees at Hunt Institute of Botanical Documentation and at Chatham College. The catalogue includes an essay by artist Arundhati Vartak as well as biographical data and a portrait of the artist. The first edition sold out quickly. This is the second edition. A search on Google images indicates the very distinctive nature of the illustrations - which are packed with both plants and colour. At the end of this list of Japanese botanical artists are details of two important books about native and endangered plants in Japan which include illustrations by these artists. ​b. Hyogo Japan in 1953. Has been painting botanical art since 2004. Won Best Exhibit in 2016 RHS Botanical Art Show and an RHS Gold Medal for her watercolour paintings of "Tillandsia" (air plants). She also exhibits at Botanica in Australia and with the Society of Botanical Artists in London. In 2011 she won the Margaret Granger Memorial Silver Bowl. 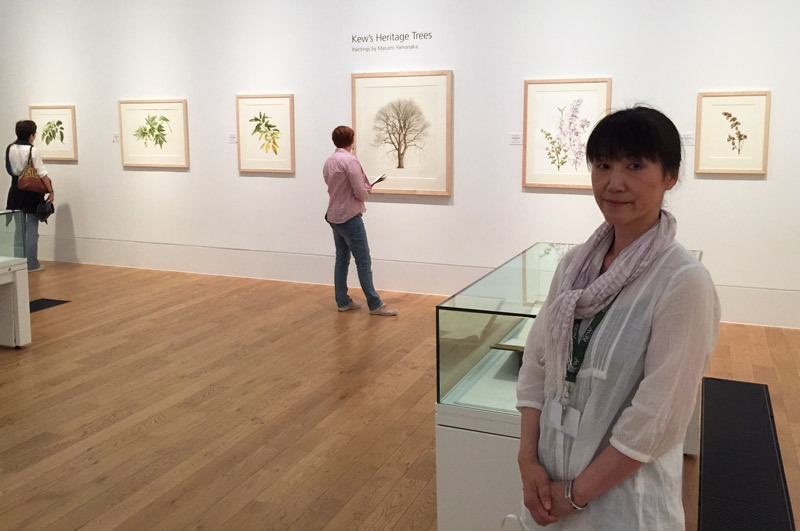 Mariko Aikawa with the Best Exhibit in the 2016 RHS London Botanical Art Show. She also won a Gold Medal for her six watercolour paintings of "Tillandsia". won an RHS Gold Medal for her watercolour paintings of "Classical Camellia Japonica" on vellum in 2016. She began painting them when she returned to live in Japan in 2012. She is also a member of ASBA having previously lived in the USA. 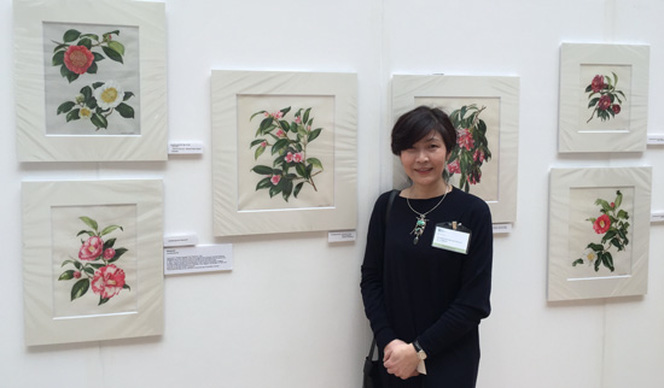 Akiko Enokido with her gold medal winning display of Classical Camellia Japonica at the RHS London Botanical Art Show 2016. ​- b. 1972 in Kyoto and now lives and works in Hyogo, Japan after living for 10 years in New York. Graduated with Masters Degree in Fine arts from Kyoto City University of Arts. 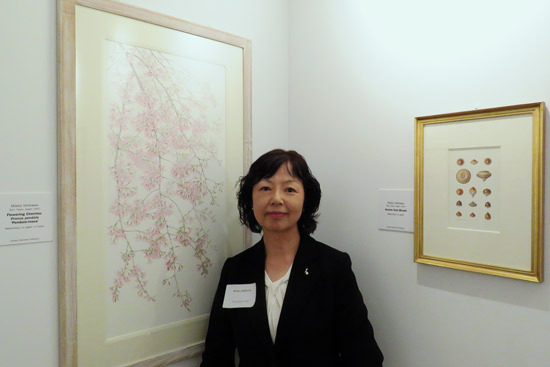 She has exhibited at the Hunt 14th International Exhibition (2013), the 12th - 18th ASBA Exhibitions with the Horticultural Society of New York (2009-15). She won a Gold Medal at the New York Botanical Garden Triennial in 2014. Her work is in the Hunt Insitute and New York Museum. I tried hard to persuade her that she how needed to exhibit with the RHS! 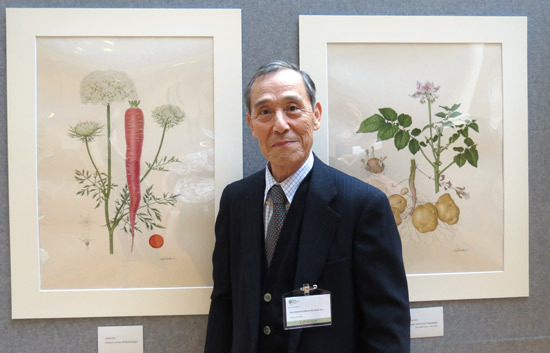 ​- won an RHS Gold Medal at the RHS Botanical Art Show for Traditional Root and Tuber Crops in Japan. He also won 'Best Painting in Show' in February 2015. In 2016 he exhibited at the International Exhibition at the Hunt Institute. Hideo Horikoshi with two of his gold medal winning paintings in his exhibit of 'Traditional Root and Tuber Crops in Japan'. He also won the Best Botanical Painting for "Apiaceae Daucus carota ‘Kintokininjin’ "
​b. 1956- won an RHS Gold Medal for his display of Leguminous plants in February 2016. Has previously exhibited at the Hunt. Pandanus by Mariko Ikeda Keiko Fujita - Gold Medal and Best Exhibit at the RHS Botanical Art Show in 2017. The works are in watercolour painted on vellum stretched over a board. ​Lives in Tokyo. Has a Ph.D. in the Sciences of Art (2009) and was first taught botanical illustration by Jenny Phillips in Sydney in 1999. 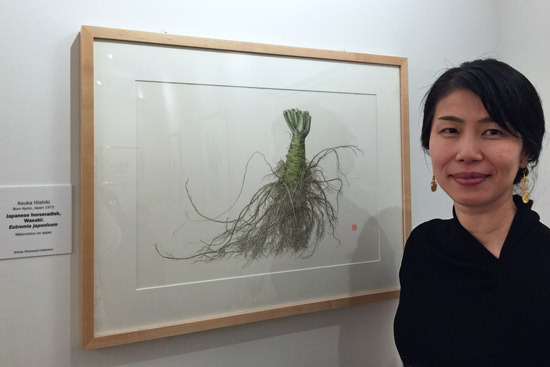 She has been a Botanical Art Instructor in Tokyo since 2006. 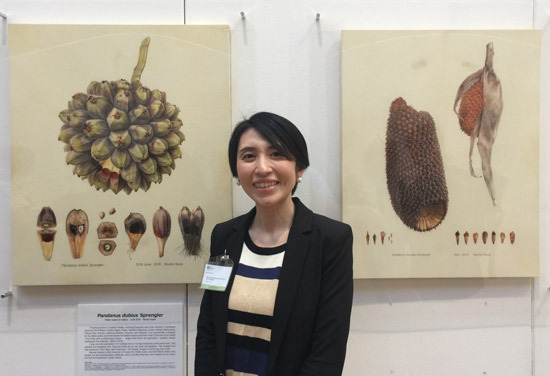 She has previously won 1st Prize (twice) at the Botanical Art Competition run by the National Museum of Nature and Science in Tokyo. In 2017 she won a Gold Medal for her exhibit of Pandanus and was also awarded Best Exhibit in show. Lives in Tokyo, grows roses in pots on her roof terrace and paints them. 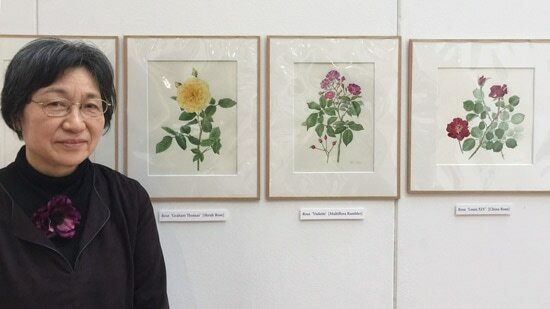 She won a Gold Medal for her Roses at the RHS London Botanical Art Show in 2017 when she exhibited ten paintings of roses. She also won a Silver Medal in 2015 and was invited to exhibit in the RHS Rose Show in 2015. Also exhibited at the Hunt's 11th International Exhibition. Mrs Mayumi Ishii with her Gold Medal winning Roses in RHS Lindley Hall in February 2017. The judges particularly admired the yellow rose. born Gunma Prefecture, Japan 1935 . Exhibited in the 11th International Exhibition at the Hunt Institute and the Flora Japonica exhibition at Kew and the Hunt. Work in the Shirley Sherwood Collection. ​b. 1964 in Nagoya but now lives in the UK. 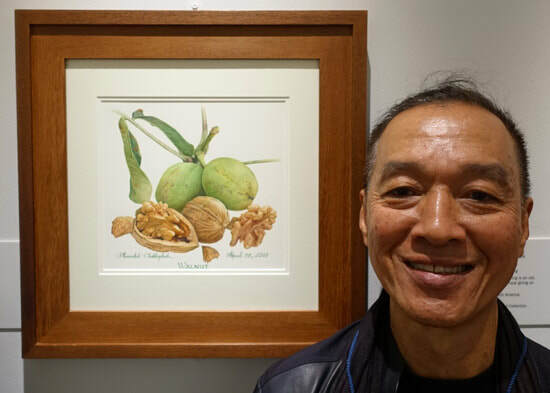 Initially a foreign language teacher, she became interested in botanical painting after visiting an exhibition of Modern Botanical Painters at the Royal Botanic Gardens, Kew. Subsequently she studied botanical illustration at Kew with Ann Farrer. She has won an RHS Gold Medal and two Silver Gilt Medals and contributed to the Prince of Wale's Highgrove Florilegium and the Transylvania Florilegium. 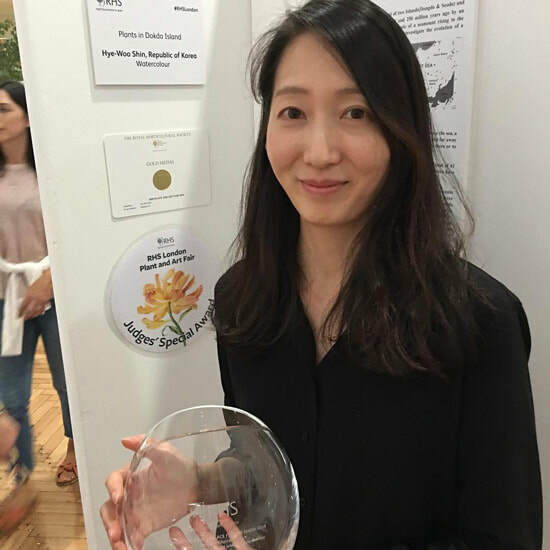 on a Gold Medal at RHS Botanical Art 2017 for her exhibit about Growth of Bamboo in Japan. From Morioka, Iwate. Previously exhibited at the 15th ASBA International. b. Chiba, Japan 1956. After taking degrees in Oil Painting and Painting, Yumi became a freelance artist. Teaches botanical painting at the Japan Branch of the Royal Horticultural Society. She has exhibited extensively in Japan and at the Hunt Institute for Botanical Documentation. She works in watercolour, oil, tempera, acrylic and pencil. ​b. Miyagi Prefecture, Japan 1943. Teaches botanical painting in Japan. 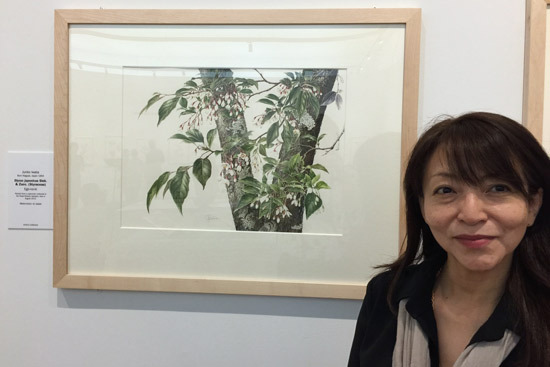 She has exhibited at the Japan Gardening Society and at the Royal Horticultural Society. Won a Gold Medal for a series about Trycitis in 2012. Kimiyo Maruyama’s Pinus palustris is a feat of attention to detail; a painstakingly painted watercolour which leaves you enraptured at her patience and skill. b. 1952 in Tokyo. Won a Gold Medal at the RHS Botanical Art Show in 2015. 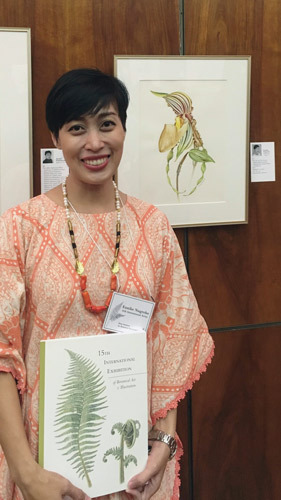 Her painting of a persimmon is the Hunt permanent collection after exhibiting at the 14th International Exhibition at the Hunt Institute for Botanical Documentation in 2013. Masako Mori's Gold-medal winning Persimmon exhibit at the RHS in 2015. 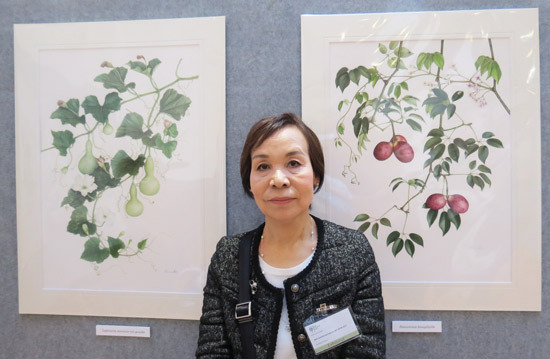 Chiyoko Ohmi with four of her six gold medal winning watercolour paintings of "Paulownia tomentosa"
Kumiko Takano's exhibit of Climbing Plants at the RHS Botanical Art Show in February 2015 won "Best Exhibit". ​b. 1954 in Hiroshima. Graduated in Art from Osaka University of the Arts in 1977. Initially worked as a kimono pattern designer. Started to study art in 2001 with Celia Godwin and Pamela Stagg at the University of Toronto before she returned to live in Japan in 2004 where she studied with Masako Sasaki. She won an RHS Gold Medal for a series of watercolour paintings of Hydrangeas in 2006 and in 2007 her work featured n the cover of the Hunt Institute Bulletin. 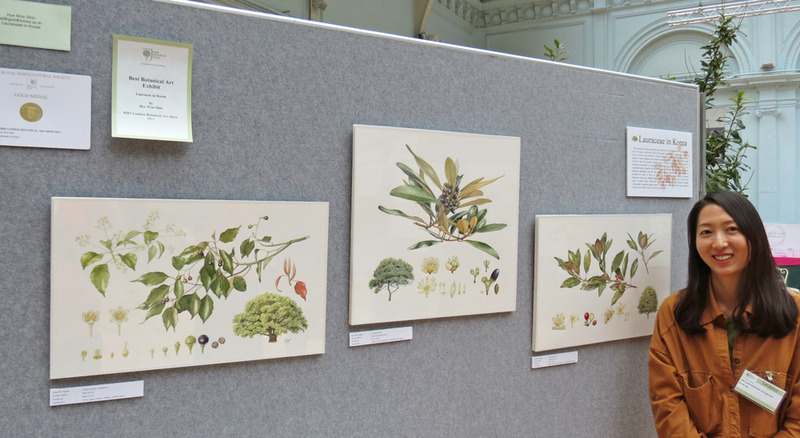 Two of her watercolours of Hydrangea quercifolia (2005) are in the Hunt Institute’s permanent collection. Her work is also in the collections of the RHS Lindley Library and the Shirley Sherwood Collection. ​b. 1965 in Yokohama. Graduate of Tama University of Art, Initially a designer she is now a full time botanical illustrator and teacher. Specialises in painting the wild flowers of Rebun Island, off the northern tip of Hokkaido. Her distinctive style displays the plants in their habitat (echoing Marianne North and Margaret Mee). 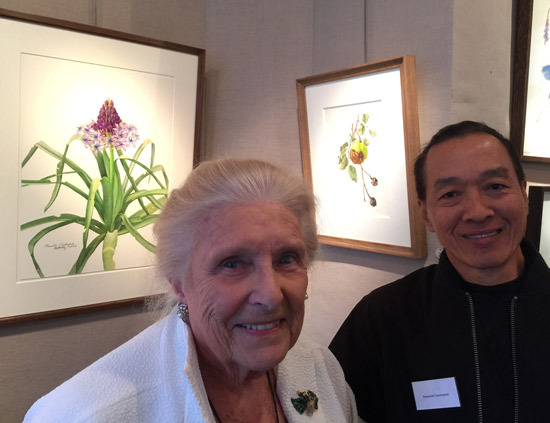 She has received many awards for botanical painting, including an RHS Gold Medal in 2003 for an exhibit of Spring Flowers on Rebun Island. She exhibited at the 10th International Exhibition at the Hunt Institute. This is MUST BUY for the library of any serious collector of books about botanical art. I've much admired the paintings of native flora by Japanese artists that I've seen at various exhibitions in recent years. This book enables you to learn more about the artists and have a permanent record of the excellence of their work. ​This splendid NEW book is about the native flora of Japan and how this is depicted in contemporary botanical art. 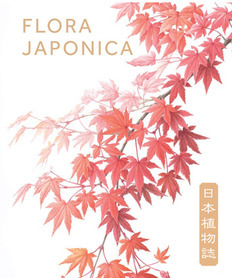 Kew Publishing produced it to coincide with the excellent Flora Japonica exhibition at the Shirley Sherwood Gallery at Kew (2016). It contains images of all the paintings in the main gallery. information about where the specimens painted were collected. This book was published in 2004. It is outcome of a project established in 1998 by the Japanese Association of Botanical Illustration to paint Japan’s rarest flora from living specimens. Their aim was to focus public attention on the increased risk facing many of the country’s endemic flora through, in most cases, habitat loss and over collecting. The Florilegium contains 182 species. However these represent only 10% of the total endangered plants in Japan. This is an article about the 2005 exhibition of the paintings in the Florilegium at the United States National Arboretum and at the Chicago Botanic Garden. This file contains 17 plates from the exhibition. Lives in Seoul. Suyeon did her Diploma Course in Botanical Illustration at the Royal Botanic Garden in Edinburgh and graduated with her Diploma in 2011. She has been studying and painting plants endemic to Korea for some years. 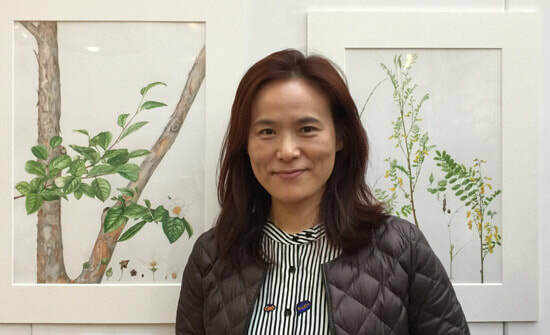 President of the The Korean Society of Botanical Illustrators. MFA at Chung Ang University, Seoul. Completed Certificate of Botanical Art and Illustration at the NY Botanical Garden in 1998. In 1999 she received the "Best of Show" award at the Art In Science International Exhibition at the Missouri Botanical Gardens, Missouri. Jee-Yeon Koo's art is in many public and private collections around the world including the Korea National Arboretum. The video is of a 2011 exhibition of her botanical paintings Dongduk Women’s University Museum. ​She was one of the main organisers of the Flora Korea exhibition for BAW in 2018. 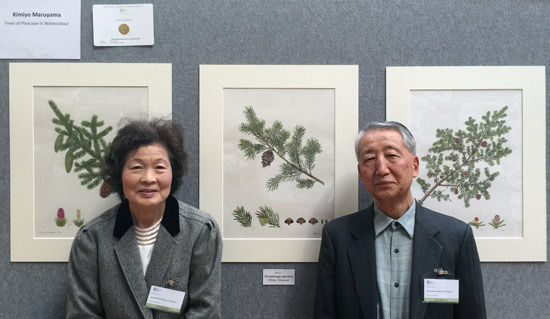 RHS Botanical Art Exhibition 2013: Gold Medal and Best Exhibit in Show for 'Lauraceae in Korea' by Hye Woo Shin. In 2013, she exhibited with the RHS for the first time and won her first Gold Medal and her first 'Best Exhibit in Show' for 'Lauraceae in Korea. 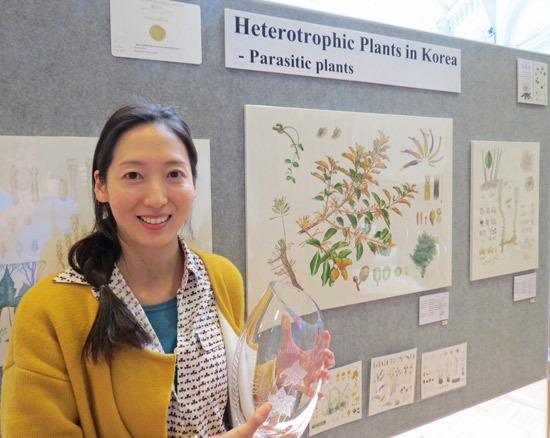 In 2014 she won another Gold Medal for Heterotrophic Plants in Korea and again won the 'Best Exhibit in Show' award. In 2015 she exhibited with the Royal Caledonia Horticultural Society and won another Gold Medal! In 2016 she was selected for the 15th International Exhibition of Botanical Art and Illustration at the Hunt Institute. To top it off she also invented a completely new way of displaying botanical art! 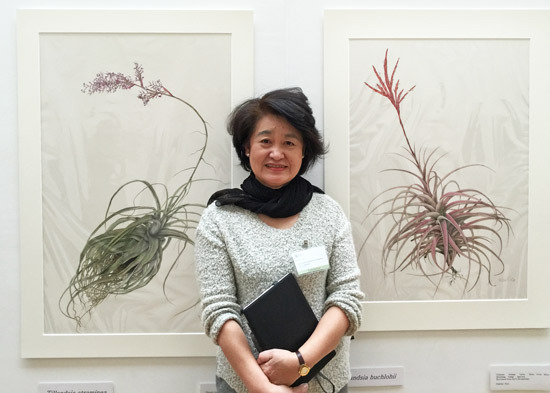 Read an interview with Hye Woo in "Interviews with six RHS Botanical Art Gold Medal Winners (2014)". Phansakdi Chakkaphak - born Chonburi, Thailand 1949. He has a degree in architecture from Bangkok University and a degree in Plastic and Graphic Arts with Distinction from the University of Illinois. He began painting in watercolour in 1991. He has designed and illustrated many publications on botanical art. His work has been exhibited in various group shows in Bangkok, San Francisco, and New York. A number of his watercolour paintings have been purchased by Dr Shirley Sherwood and added to her collection. Sansanee Deekrajang (born in Bangkok in 1980) - Sansanee is from Bangkok but now lives in Lothian in Scotland. She has a degree of art and has specialised in fine art printmaking in the past. She taught herself how to do botanical art and won an RHS Gold Medal for her watercolour paintings of tropical plants in 2016. She has a particular talent for producing very bright paintings full of content with excellent compositions.